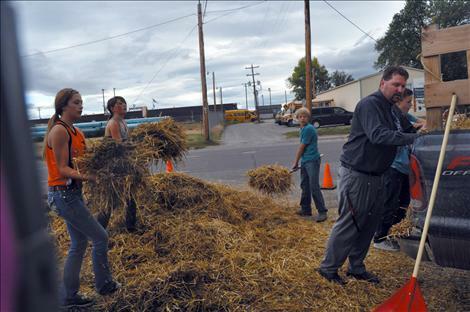 Noah Cheff, Ashtin Courville, Cori Normandeau, Veyanna Curley, and Principal Curt Schutzmann shovel up hay that was left scattered after young vandals caused $8,500 worth of damage at Ronan Power Products. RONAN — Four Ronan Middle School students spent Friday morning cleaning up vandalism some of their peers had caused a few days earlier. 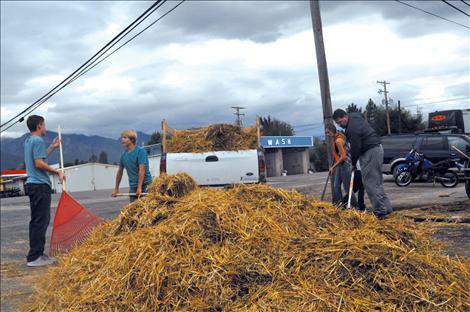 Noah Cheff, Ashtin Courville, Cori Normandeau, and Veyanna Curley took two hours to shovel hay that lay strewn on a corner of Round Butte Road. 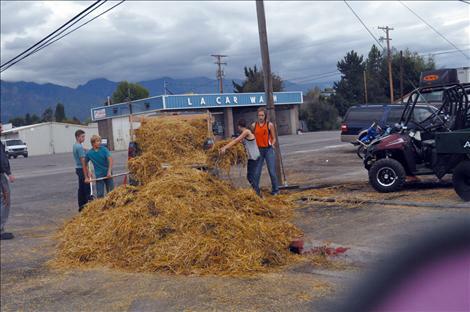 The mess was caused by three teenage girls who lit a decorative hay bale on fire at approximately 7 p.m. on Sept. 15. The fire resulted in $8,500 worth of damage to ATVs owned by Ronan Power Products. The blaze was put out quickly by Ronan Volunteer Fire Department before it could spread nearby to the business’s building or the Access Montana tower. Ronan Power Products owner Shane Shima said he decided to leave out the debris from the fire for a few days to give the vandalizing teens and their parents the chance to come in, apologize, and clean the mess up themselves. The business didn’t hear a peep from those responsible. Ronan Middle School Principal Mark Johnston called Shima on Friday saying some young volunteers would be over shortly to lend a hand in cleaning it up. “We wanted to get it cleaned up,” Vice Principal Curt Schutzmann said. Soon after, the Good Samaritans arrived, pitchforks in hand to shovel up the hay left behind. What could have been a drag of a task was fun for the kind-hearted volunteers. “It’s way better than sitting in class,” Normandeau said. Shima said he was appreciative of the teens that came to clean up the mess. Shima said he was also grateful for employees of the Ronan School District, Ronan Fire Department and others who came running to help put out the blaze before it got out of control. Those in the community who did good might still end up paying the cost of those who did wrong. Since the incident Ronan Volunteer Department Chief Mark Clary said there will likely be new rules about where the bales are allowed to be set up. Clary said he likes the bales and doesn’t want to be the bad guy, but that he has to think about the safety of the town. With the bales so close to buildings, a haphazard spark from a cigarette could lead to major problems, he said. Harvest Fest organizer Ronna Walchuk said it is disappointing that the act of the young vandals had such an impact.